It is a great pleasure to welcome you to another great year ahead for the Futures Initiative. We are anticipating another year full of great ideas and inspiring people—and we look forward to your participation in our common project. 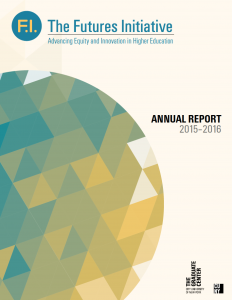 Advancing equity and innovation in higher education is a big goal—and a vague one. It is through the work that we all do, together, that we are able to find ways to put those lofty ambitions into actual practice. During the summer months, we were all hard at work at the Futures Initiative on several projects that we’ll be keeping you abreast of all year. We are joined by three fabulous new fellows and said goodbye to two members of our exceptional first class of fellows. We are pleased to welcome Thomas DeAngelis, Earth and Environmental Sciences; Michelle Morales, Computational Linguistics; and Jessica Murray, Human Development. And we wish all the best to pioneering FI Fellows Michael Dorsch and Lisa Tagliaferri. Michael is currently living, working, and finishing his dissertation in Monterey, CA (lucky guy). He’s been a fabulous asset to our program as a primary data researcher leading many projects, including the wonderful 2015-2016 Annual Report. Lisa has moved on to a terrific full-time position at DigitalOcean as an Engineering Technical Writer. She has been our chief technology designer and programmer, has taken the lead several different initiatives, and has been tireless in support of our program. She reports that, at her new job in technology work, humanities PhD’s are everywhere! 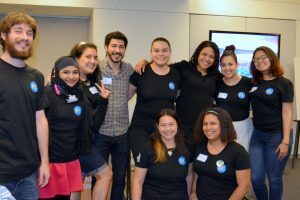 This summer we also were part of the team kicking off the CUNY Humanities Alliance, a partnership between the Graduate Center and LaGuardia Community College. Kaysi Holman is Director of Programming and Administration for the Humanities Alliance and she is also joined by postdoctoral fellow Kitana Ananda and Humanities Scholar Elizabeth Alsop. Kitana will be working directly with the Futures Initiative on building out the platform, doing ethnographic research on our progress, and working as a general communicator and researcher in the program. Elizabeth will be working with the team at the Teaching and Learning Center with a special charge to take what we learn about community college teaching and about teaching and learning more generally and extend it to Graduate Center faculty and other graduate students as well as throughout the CUNY system. Stay tuned for many updates! We also got started with a Teagle Foundation project on Peer Mentoring led by Lauren Melendez, Academic Specialist and Director of Undergraduate Mentoring for the Futures Initiative, Mike Rifino (Futures Initiative Fellow and Director of Social Networking and Peer Mentoring), and Thomas DeAngelis (Futures Initiative Peer Mentoring Liaison). Once again this year we will be hosting a lecture series, “The University Worth Fighting For.” We’re partnering again with the HASTAC network on this and our HASTAC Scholars Co-Directors, Kalle Westerling and Allison Guess, will be kicking off all of our livestreamed events with “Twitter Chats” conducted by the Scholars. Here’s our roster for the year. It’s ambitious and exciting. 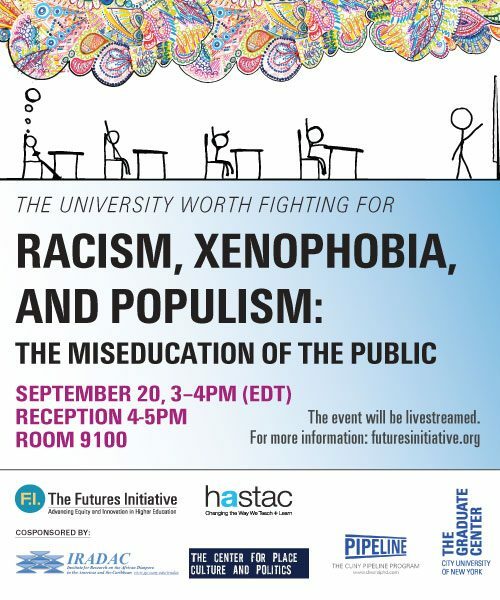 We hope that you will join us for our first public event of the year, "Racism, Xenophobia, and Populism: The Miseducation of the Public," on September 20 at 3pm. The panel discussion will feature Jessie Daniels (Lehman/GC), Mary Phillips (Lehman), and Linda Sarsour (Arab American Association of New York), and will be moderated by our postdoctoral fellow, Kitana Ananda. Details are below, and you can RSVP here. We have a terrific lineup of interdisciplinary courses, with faculty members hailing from the Graduate Center, as well as Brooklyn College, City College, the College of Staten Island, the CUNY School of Public Health, Hunter College, John Jay College of Criminal Justice, and Queens College. 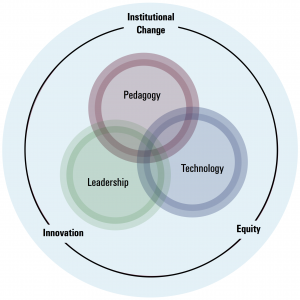 The focus across all of the courses will be Diversity, Access, and Equity Across the Curriculum. It's hard to believe, but we're already looking ahead to 2017-2018. If you are interested in team-teaching with us, take a look at this call for proposals. Course proposals are due November 1, 2016. We feel such strong support throughout the Graduate Center, CUNY, and HASTAC communities. Here's to a great year ahead!